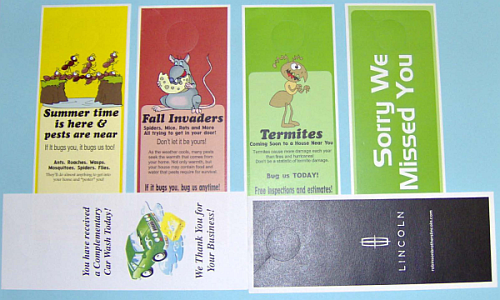 Door hangers are still a great way to get your customer's message out. They can be used by service people to let a customer know they are sorry they missed them. Churches can use them in neighborhood canvassing campaigns or their visitation ministry. Door hangers can hang on more than doors. Automobile dealerships can use them to identify cars being serviced or advertise services such as oil changes by hanging them on a rear view mirror. They can even be used to hang on wine bottles to inform customers of sales or how the wine is best served. SEF, Inc., can print your door hangers in black and white or full color. Call today for a quote at 800.633.1212.